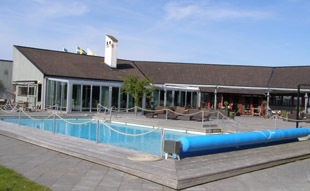 Torekov Hotell is located in the exclusive seaside area of the northwest point of the Bjäre Peninsula in Skåne, Sweden offering guests luxury accommodations, an excellent restaurant, and a pampering Spa. 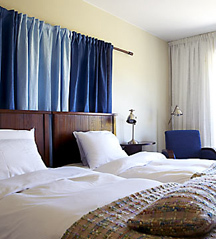 The 54-room and 3-cottage Torekov Hotell opened in July 2007 and may be small in stature but is large when it comes to amenities creating a very personalized experience for each of its guests. Located near the rocky coast of the scenic Bjäre Peninsula, the logo for Torekov Hotell is three smooth stones, with the theme continued throughout the hotel. 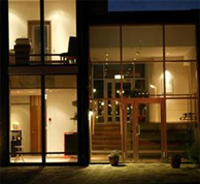 The architecture is clean and sleek with contemporary lines elegantly combining form and function. Entering the reception area, my eyes immediately took in the polished wood and tile floor, light wood reception counter, and the professional and attentive staff. 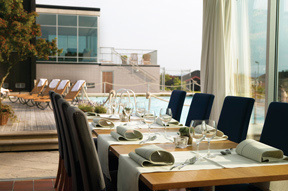 The Restaurant at Torekov Hotell focuses on using local products so the cuisine is as fresh as possible, and breads are made daily in the restaurant's kitchen. During our stay at the hotel in May 2008, Edward F. Nesta and I had dinner at the restaurant where a few of our selections included Asparagus & Tuna; Artic Char with Summer Vegetables; and a trio of Rhubarb and Coriander desserts. In the morning we enjoyed a leisurely buffet breakfast, and of course, toast made from the famous Torekov breads. There is a seasonal outdoor swimming pool and wood-fired hot tub on the large deck where we sat at a table with a rattan sofa enjoying a late afternoon latte while soaking up the warmth of the sun. Nature was at its best with the gentle sound of birds singing and a slight breeze caressing us. The attractive deck featured grass in square pots, ivy topiaries in tall pots, Shasta daisies, and purple petunias in pretty ceramic pots arranged between the rattan chairs and chaise lounges, and a tree growing out of the deck, combining nature into the architecture. We indulged in pampering Spa treatments in the attractive 400-meter Spa, which features Comfort Zone products from Italy, and a varied Spa menu. In addition to the Spa treatment rooms, guests may also have Spa treatments outdoors in a Philippe Starck cabana. 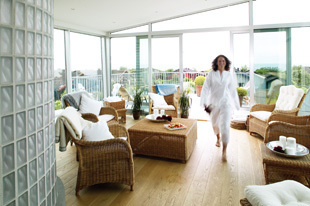 The well-equipped Spa has a sauna, steam room, Japanese and cold plunge pools, relaxation room, Spa Shop, and a Gym. Our comfortable guestroom featured a wide plank light wood floor, and varying shades of alternating blue fabric hung on a rod to create a focal point and add visual interest behind the polished dark wood headboard. The bed was dressed with pristine white fluffy duvets and a selection of pillows, and at the foot of the bed, there was a gorgeous soft textured knitted throw and two decorative pillows in shades of beige, blue, and green. Silver reading lamps graced half round bedside tables, there was a floor lamp behind the comfy blue upholstered chair with curved wood arms placed in the corner of the room, and a small round table accessorized with a round glass bowl filled with white smooth stones and a lovely photography book placed in front of the ivory sheers that covered the French door leading out to a small patio with lounge chairs and a table. There was also a large desk and blue upholstered chair where we sat to use the in-room wireless (WIFI) Internet access. Other amenities included a LG flat screen television, ample closets with a safe, iron and ironing board, robes, and the delightful surprise of leather clogs (in our sizes, and available for purchase) instead of the cotton slippers that one usually finds at hotels. The sleek bathroom featured a grey tile floor and white tiles in the walk-in shower with rain showerhead as well as an adjustable handheld showerhead. There was a hairdryer, vanity mirror, and an assortment of Lanvin Paris amenities on the vanity. In addition to exploring the area, or swimming off the pier along the rocky Torekov coast, golfers will be interested to know that the hotel has an arrangement with several nearby courses, although we unfortunately did not have time to play a round of golf during our visit. Read about Torekov Hotell in the Destinations, Restaurants, Chefs' Recipes in English, Chefs' Recipes in Swedish, and Spas sections. Read other articles on Skåne in the Destinations, Restaurants, Chefs' Recipes, Arts and Antiques, Spas, and Gastronomy sections.